Home > Dell, Microsoft, Virtualization	> Windows 8 : Why should my hardware have SR-IOV capabality ? 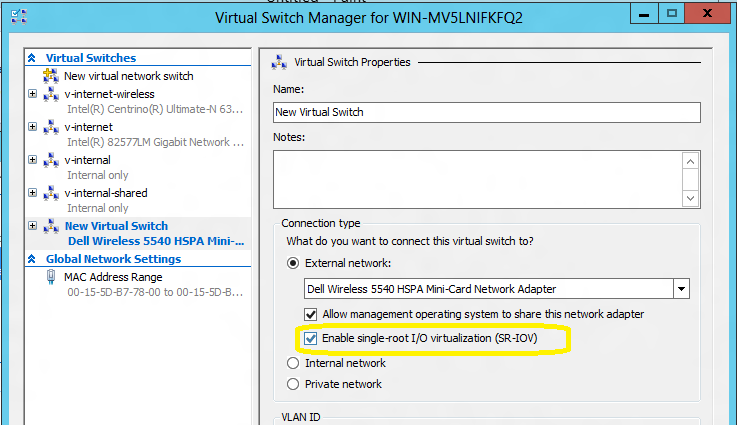 Windows 8 : Why should my hardware have SR-IOV capabality ? SR-IOV capability will significantly reduce the overhead on network IO operations. It allows for a virtual machine to have near native IO against the physical NIC, allowing applications that require very low latency to work inside of virtual machines. Dell PowerEdge 12th Generation servers support the SR-IOV servers but previous generations have exceptions. T410, R410, R510, R610, T610, R710, T710. These servers will be physically marked with symbol “II” on the Express service tag. The Express service tag is located in front panel of the system. Intel X520 10GB Ethernet adapters. Because Windows Server 8 Beta is a pre-release product still in active development, Dell does not provide any support for this pre-release software and it is not recommended for use in a production environment.